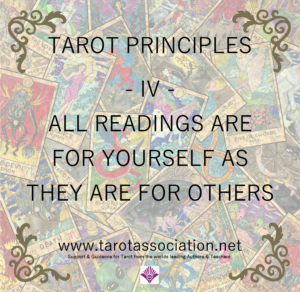 All Readings are for Yourself as they are for Others. The Tarot is a Means of Recognising Your Own State. It provides a guide towards a more consistent, comprehensive and congruent state. Every card and combination is an image of your own existence in the world. So, we can use tarot to see into our own life as we see into others – and our relationship to their life at that moment. Remember then, from the very beginning, that the tarot is a powerful machine to engineer your life as much as it can change anothers. We continue with our simple practice today. Imagine that you are reading for someone else – an imagined person we will call Alex. Alternatively, find someone in your life with whom you can practice and has no particular expectations of your reading. If you are reading for a real person, ask their permission and share the reading with them. Shuffle your deck, thinking of the other person. Lay them out FACE UP in a line, left to right. We take these three cards as a reading for the other person. Interpret this card as a challenge for the other person. Interpret this card as a resource which may not have been considered by the other person. Interpret this card as an OUTCOME or OUTCOME WHICH WILL BE AVOIDED depending on the card. Do not be concerned if you are unsure as to the meaning of each card – we will return to ‘meaning’ in the next lesson. For now, get used to the idea and speaking as if you were reading for someone else, using the same approach that you have already practiced – nothing more. 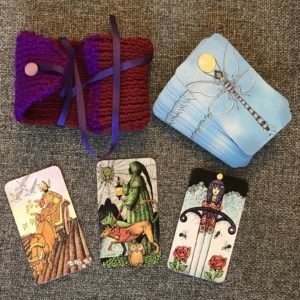 In our next lesson, we will go around the cards in another way, continually deepening our readings; and so far, we are neither relying just on intuition, guesswork or learning static meanings – we’re doing a bit of everything! In fact, we’re doing something totally different. “Your challenge is to throw your seeds into fertile ground – which to me means that you have a challenge making money. However, you have the resources of a hermit – you know that you are on your own path and can give illumination to others. When you continue to stick to your own path and insights, you will have the outcome which is the sharp sword of clarity and then the bees will make honey from the roses. I take this to mean that your clear thinking will make you money – because you have stuck to your own path and not followed others”. If you are unsure whether the third card is an outcome or an outcome which will be avoided by meeting the challenge with the resources, then consider how the card looks compared to the other two cards. If it looks more ‘negative’ then it is likely an outcome which will be otherwise avoided. If it looks ‘positive’ we assume it is an outcome that will be attained by meeting the challenge in the manner suggested by the second (resource) card. We say this because all readings are generated towards a positive outcome. To record your tarot readings, you are encouraged to adopt a common key, as follows. Minor cards: Label as the number and suit. For example; 7P, 3C is 7 of Pentacles, 3 of Cups. You can label Aces as 1 or A, so 1C or AC would be Ace of Cups. Major cards: Label as their Latin numerals. For example; III is The Empress, XVIII The Moon. Court cards: Label as abbreviation of type and suit, with Kn for Knight and K for King, to avoid confusion. For example; KnS is Knight of Swords. So long as you are consistent in your layout and order, this is enough to record the reading with any commentary you wish to place upon it. Our example reading today would be recorded as as KnP/IX/AS. See Tarosophy for this method of recording readings and a handbook of ground-breaking approaches to Tarot with 50 unique exercises. It is the book that jump-started a revolution in tarot! In this fourth principle, we start to add optional exercises for those who wish to extend their practice. Consider how knowing this reading affects the way you think about the other person and their situation. After you have read the cards as if for another person, consider and make a note of any situation in your own life where this reading would have applied to you. We have provided our own suggested starter list of keywords for challenge/resource/lesson as an appendix in our most recent book, Tarot Time Traveller – but you should be writing your own too!